Sadly, our FujiFilm camera suffered from a very common fault which is the result of bad design. There are literally hundreds of reports online of exactly the same problem occurring with FujiFilm cameras in all countries where the XF1 was sold. After our camera went wrong, we then discovered the other very common problem experienced by FujiFilm customers: The guarantee is worthless because FujiFilm does not honour the guarantee when their cameras fail, even when they fail from a well known and common fault. On the 28th of August 2014 I bought my wife, Judy, a gift of a new camera. A Fujifilm XF1, which had been discounted in a local supermarket from a previous price of around €300 to €149. The XF1 not only looked attractive but it had a great specification and I was pleased to find it at a reasonable price. The impressive EXR CMOS sensor allows very wide dynamic range in photos by pairing pixels, ISO settings up to 12800 are possible, the camera can take HD video with stereo sound, and it has a full range of manual controls should you want to use them. The aluminium case promised a level of robustness that you'd perhaps expect from a plastic case camera. Reviewers described the camera as being a "stunning design" and having "excellent build quality". Unfortunately, reviews are generally written immediately after products are released and cannot be relied upon to reflect the long term quality of a product. This review is different. I'm going to tell the truth about what happened to a camera which was used quite lightly and carefully for just seven months before it first went wrong. This camera took just seven months to fail due to a known production fault. Fujifilm refuse to fix it. Our camera displaying the "Lens Control Error" message. Many people have found that their Fujifilm XF1 cameras fail with a "Lens Control Error", it's a very well documented problem with this model of camera. But Fujifilm blame the customer for the fault. April 12 2015: Images were increasingly overexposed. This was the first sign of the problem. Already these photos are unusable. April 30th 2015: Background is completely whited out. An interesting effect with these beans, but it's not accurate. May 10th 2015: At this point the problem appeared to be related to zoom. Zoom past "35" and the result was a washed out photo like this, while otherwise the photos could still be quite good. After taking a photo which is overexposed like this one, the camera would always report a "Lens Control Error" and you'd have to shut it down and restart in order to take another photo. May 10th 2015: The extreme colours of this photo are as they came from the camera. Even indoors and not zoomed in, the camera would sometimes do strange things with photographs such as produce these extreme colour shifts. May 24th 2015: In less than eight months, the camera has become completely unusable. It rarely produces a photo which has any value at all. This is the result indoors in a relatively dark room on a cloudy day. By the end of May 2015, the camera was completely unusable. The "Lens Control Error" message would appear on power-up most of the time, and if you were lucky enough ever to be able to take a photo before the error appeared, it would shut the camera down after a single photo had been taken. The results were in any case as shown above. I live in the Netherlands. 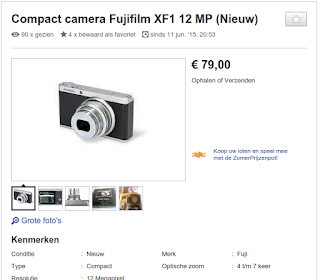 In August I bought a Fujifilm XF1 camera as a present for my wife. The serial number is 2DQ42707. This camera has now stopped working properly, just nine months after purchase. The fault shows itself as a "lens control error" reported on the screen on the back of the camera. Photos which have been taken with the camera are now over-exposed to the point of being completely useless. Searching on the internet I find that this is a common fault with the XF1. How will fujifilm rectify this fault ? You will note that there was no request from FujiFilm for us to enclose any documentation with the camera. At this stage it appeared that they recognised the problem as a production fault and intended to fix it. 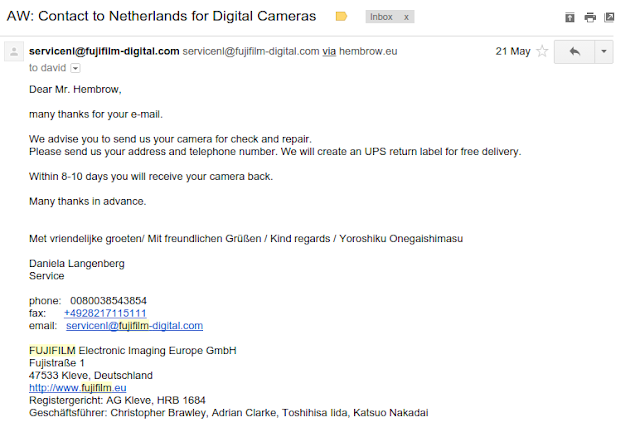 This screen grab is from after the camera was returned to us, so redirects to the shipping company rather than allowing tracking within FujiFilm's own system. The next screen-shot down shows what FujiFilm's system displayed on the 29th of May. 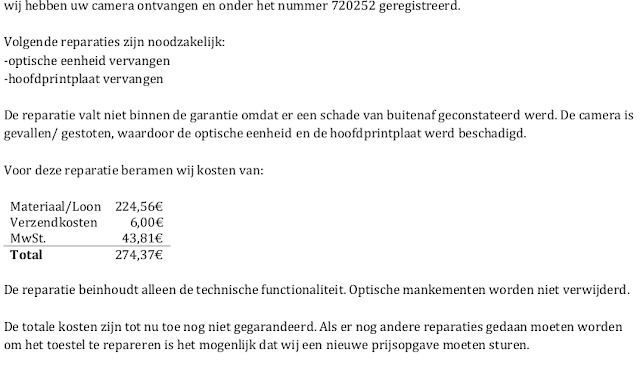 Note that the total repair price is shown here as € 0.00. At that point it appeared that the non warranty repair was to cost nothing. This was a strange way of dealing with customers, but I was happy with this if it meant they would stick to their original promise of repairing the camera. 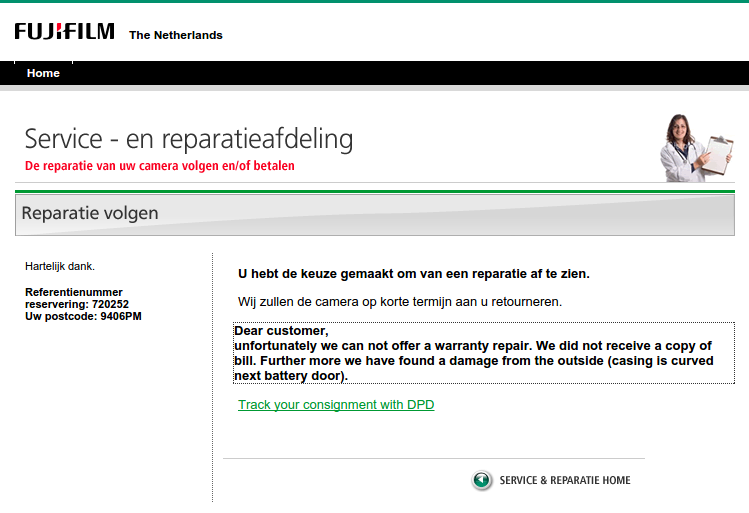 I clicked on the "Doorgaan met reparatie" (go ahead with repair) button and also sent email asking for clarification. 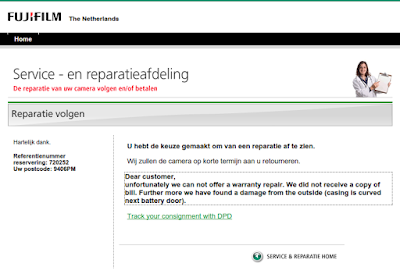 Later on the 29th, I received a further email from FujiFilm which made it clear that the € 0.00 which their website had offered us was not the price that they wanted to charge us for repair. Their email included two attachments. One attachment was a photo claiming to show the damage which they claim caused the fault. I was surprised by the company's insistence that we had damaged the camera because any portable device has to be designed to be robust and this particular camera, though not an "action cam" was actually being sold on the basis of its robustness due to having an aluminium body in place of plastic. In any case, Judy is extremely careful with cameras. She's far more careful than I am, always using a wrist strap, always making sure that the camera is stored in a bag while cycling. It's rare that Judy breaks anything. As such, she was quite upset about dropping her camera from her desk onto a carpeted floor during the first month of ownership, but as this supposedly "robust" camera had shaken off that fall with no sign of what had happened except for a slight deformity around the battery door we forgot about it. Of course, mobile devices do need to be designed to be robust. Such a minor fall should not result in anything other than minor cosmetic damage. This didn't affect operation of the camera at all. As such, it was clear that this fall had no connection whatsoever with the commonly reported manufacturing fault for which we had returned the camera, but unfortunately FujiFilm were looking for excuses not to repair a fault which was of their own making. Further down this page you'll find other FujiFilm customers report that FujiFilm blamed external damage for the same fault on their XF1 cameras, even when there was no external damage before the product was sent in for repair. They want to charge us how much ? With no guarantee ? So they're offering to replace the optics and the main printed circuit board, claiming that both were damaged by bending the battery compartment door and demanding a total of €274 for this repair. That's nearly double the original cost of the camera. Note that though the battery door damage is claimed to be important, they're not offering to repair the battery door for this price. What's more, at a total cost of nearly double the original price of the camera, the last paragraph points out that they don't even guarantee that this fix will be all that is required to restore correct operation of the camera. On June 16th the camera was sent back to us, in exactly the same condition as we sent it to FujiFilm. They have not attempted a repair, but have enclosed a letter which says "As previously communicated several times our technicians confirmed an external damage, from which it results than the warranty is void." 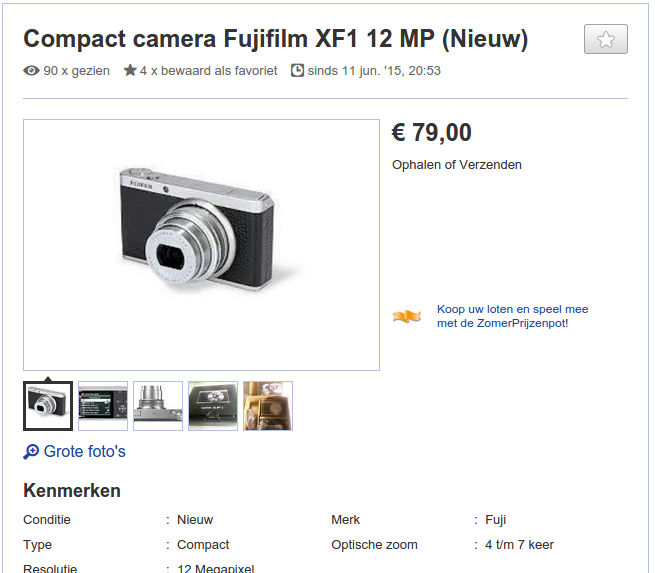 Fujifilm has sold us a €150 paperweight. I'm glad I didn't pay full price for this dreadful product. Has anyone ever gotten Fuji to take responsibility for this "Lens Control Error" issue? I spoke with Fuji yesterday and they told me that this was not considered a "Known Issue" and that it would cost me at least $140 to have repaired (though probably much more, since the lens assembly will most likely need replacing). When I said that there were many documented cases of this defect, the Fuji tech rep laughed at me and said, "so you think because 50 people on a forum have had this issue, it's Fuji's problem?" This is what we're up against, the company keeps pretending that this isn't a mechanical defect on their part, when a quick Google search shows that tons of people are having this same issue. So until Fuji does the right thing and fixes our cameras, we're stuck with $500 paperweights. During this past summer we bought not one, but four XF1s among the friends and family [...] The lens, alas, became the fatal problem, which I'll describe in more detail later. During the summer we shot thousands of pictures, and the camera failed within 6 weeks, right outside the return period. Granted, I shoot a lot more than the average user, but there was no explanation for this. I thought maybe we did something that caused this failure, but in reality we babied the camera without ever abusing it [...] However, in time, ALL of the other three cameras developed the same problem. I purchased these in July, and the last one developed this problem at the beginning of November--the one that's probably the least used. This denotes that the problem isn't isolated, but results from a design flaw, that in my four cameras, caused a 100% failure rate [...] The service rep looked up the info and said that they found a ding on the front of the lens housing, suggesting impact damage, resulting in the lens error, and the warranty was voided. I tried to explain how the front lens housing has a very thin sheet metal, and can easily be dinged (e.g. putting it in the pocket with other things? ), and how I have three others in pristine condition with the same problem, proving its irrelevance. This is a description of exactly the same symptoms as we had with our camera, and he has also experienced exactly the same response from FujiFilm. 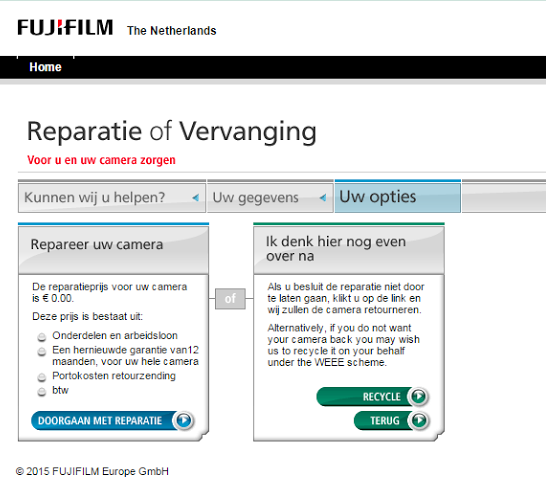 That's despite dealing with the US division of FujiFilm while we're in the Netherlands. Our XF1 had the exact problems as yours. This one guy had the same problems with 4 units and he documented his experience on amazon. I knew what I might run into with their repair facility so I did a video of our unit to show there was no "impact damage" which is how the repair facility gets out of warranty repairs apparently. Sure enough, when I called in, they claimed just that. I told them that I did a video that would prove that there was no such damage. They tech told me that he'd call me back after he talked to the manager (NJ repair facility). He called back and said they'd drop the $140 repair charge and honor the warranty. If anyone goes this route of a repair, I'd recommend being prepared should they claim "impact damage" if there wasn't. The aluminum on these has been designed to be worn off with ease to lend itself to this worn retro look and ours had that. My wife kept it in her purse so you have rubs and little scratches but that's it. This "lens control error" problem is clearly a design problem and I'm guessing the success rate of the repair facility manager is predicated on how many units they can invalidate the warranties or simply not repair under that status. It's a shame. I love their products or "loved" them. On youtube you can find a video from someone who had the same error and who tried to take the camera apart to fix it himself. I've not tried this, but as the camera will otherwise be scrapped because FujiFilm won't repair their own product, perhaps I may try it at some point in the future. There is nothing to lose. There's even a Facebook group specifically for talking about the FujiFilm XF1 Lens Control Error problem. A quote from that group: "My Fujifilm XF1 still has the LENS CONTROL ERROR. Fujifilm just don't want to know. I told them about the problem weeks ago, but they said I would have to pay a minimum of £85 to have them take a look at it. I told them it was a well known fault they knew about the camera and they should cover the cost." 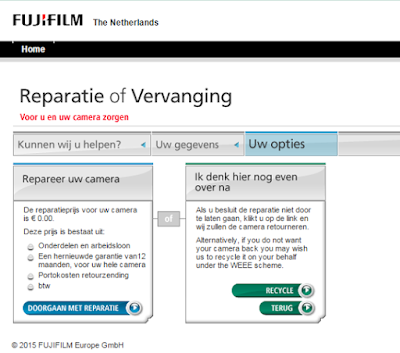 A Dutch review website also has many reports of this same problem with the camera and the same problem with FujiFilm refusing the honour the guarantee. Some of the reports of the Lens Control Error problem actually date from before I bought our camera. I had even read a couple of them before buying, but I made the assumption that these were isolated problems and that FujiFilm was an honorable company which would put right any faults under guarantee. I was wrong to make that assumption. This is probably the poorest customer service I've ever experienced. I will never buy a FujiFilm product again, and I suggest that you don't either. How can I trust any product from a company which doesn't back up their guarantee even when it is clear that the failure was due to a manufacturing defect which affects hundreds of customers ? You can still buy these cameras new. The lowest prices now are under €80, which would of course be a ridiculous bargain if the build quality of the camera was anythere near what it supposed to be. No other manufacturer's cameras of similar claimed performance are discounted to anything like this extent. There's a good reason why this is the case. If you're offered a FujiFilm camera, even at a sharply discounted price, RUN AWAY. The serial number of our camera is 2DQ42707. As I understand it, the first digit indicates the camera was manufactured some time in 2012. They'd been for sale for quite some time before we bought ours. Three year solar anniversary. 10 Megawatt hours from the sun. 5 o'clock in the afternoon on Sunday 5 April 2015. Almost exactly three years since this installation went online. Generating just short of 2800 W at the moment when this photo was taken. Three years ago exactly, we had an array of 16 large solar panels installed on the roof of our home. I can now report on how well they've done over those three years. Each panel has a nominal 225 W output, for a total of 3600 W. These figures are not the often inflated figures which you see from cheap solar products, but realistic figures allowing for aging and including compensation for siting. In fact, our panels occasionally over-perform slightly relative to their specification. Our peak recorded output is 3997 W. That's enough electricity to actually do something useful - like run our home and business. 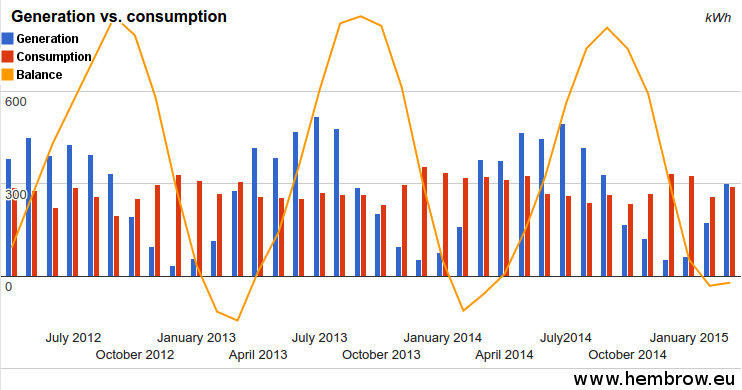 The monthly electricity generation figures are in blue, consumption is in red. The yellow line shows the sum. You'll note how this goes upwards in summer as we generate more electricity than we use, and downwards in winter when we generate less than we use. Note how both the blue and yellow make a very fine approximations to sine waves - exactly as they should given that these numbers result from the circular orbit of the earth around the sun. The graph shows that in the first year we used slightly more electricity than we produced. In the second year we did slightly better than break-even and in the third year we used somewhat less electricity than we produced. That's why the lowest dip on the yellow line has risen upwards towards unity for the lifetime of the panels. Given that solar panels can only degrade in use (the light which must fall on the panels in order for them to generate electricity also slowly destroys them) this may seem surprising. Actually there's a very simple explanation. The output of the panels hasn't increased, but our consumption genuinely has dropped. This isn't due to change in behaviour (we've not changed appliances, nearly all our lightbulbs were already LED). The main reason why is that our children left to set up their own homes so our energy consumption has dropped by two peoples' use. The readout on the inverter says 10200 kWh. That's an average of 3400 kWh per year for the first three years. Our installer calculated an estimate of 3150 kWh per year so the panels and inverter are performing 8% better than expected. The three year anniversary date, the 5th of April, was a bright day for this time of year and we generated 17.5 kWh. On the best bright summer days we beat that figure. However the average daily generation over the three year period is 9.3 kWh per day. The average is so much lower than the peak because on the gloomiest days of winter we generate far less than we do in summer. While in July 2014 we generated a total of 494 kWh - an impressive average of 16 kWh each day, in December 2014 we generated just 54 kWh in total which is just 1.7 kWh per day. i.e. barely more than a tenth in December vs. July. While in July we generate almost twice as much electrical energy as we consume, in December we generate less than a fifth of our consumption. The variation of output with solar power generation is an important constraint. It makes no sense at all to install them in less than ideal locations, where they're always partially shaded or facing in the wrong direction, because if you do this then the amount of electricity generated will be lower by a considerable margin at all times. Note that the peak production requires ideal conditions. Our panels are at very close to the ideal angle and they are not shaded. Less good conditions reduce output to one tenth. What happens at night / during winter ? In the case of a setup like ours, we rely upon the national grid to make up the difference between night and day and between winter and summer. People often imagine that an array of batteries would allow us to store energy generated in the daytime to use in the evening. This is not nearly so practical a proposition as the proponents of storage imagine because actually we would need a far larger array to store what we generate in summer so that we could use it in winter. A battery which could store six months worth of electricity would not fit in a small corner of our home. It would require a battery which weighed of the order of 40 tons, and this would pose a considerable short-circuit, fire and explosion hazard due to the dangerously large amount of energy being stored in one place. Luckily, at this point in history, society's consumption is higher in daytime than at night-time so the power that we supply to the grid during most days is useful to offset what would otherwise perhaps be generated by less clean methods. However at night-time our personal consumption goes up as this is when we choose to turn on lights. Practically, if human-kind is to become more reliant on renewable sources of energy such as solar, we're going to have to stop doing as much at night as we do in the day (especially on days when there's little wind to run wind turbines), and we're perhaps also going to have to live on more of an energy budget during the winter than we have available to us in the summer. Rather than worrying about a future in which we won't be able to continue on the negative and destructive path which we are on at the moment, I would see this as a positive development. Let's start living within our means without destroying the environment on which our survival depends. I calculated a while back that a human being doing a hard manual job only has the potential to generate about 1 kWh of useful energy in a day's work. That's about it for human beings. In energy terms we're worth about one "unit" of electricity a day. About 20 cents worth at current Dutch prices. People who sit behind desks for the day (as I generally have done) of course produce rather less energy. Sci-fi film "The Matrix" relies on a plot device of machines keeping human beings imprisoned in a dream-like state in order to generate energy. It's a good plot device which makes for enjoyable fiction, but it's a completely absurd notion in reality. Human beings are a terrible energy source. The machines would be far better off building arrays of solar panels than keeping human beings alive. I've been experimenting with solar power on or around my home since 1986 when I bought a couple of surplus 12" square 12 V 2.5 W solar panels and installed them on the roof of my parents' house. These generated a trickle of electricity which I used to charge batteries for some of my devices. I ran an early laptop computer off the solar panels... sometimes. For much of the year there was simply not enough light falling on these inefficient panels to do very much at all. Later on they were doubled in number and ran a 12 V lighting system in my shed. They also sometimes ran a home-made bicycle lighting setup. However while this worked splendidly in summer when I hardly needed the lights at all, in winter there was not enough power generated to keep those lights working for daily use so they were mostly charged from mains electricity. In the 1990s this low voltage system was boosted by installing a more modern and efficient 30 W panel which I still have installed on the top of my garage here in the Netherlands and which keeps a 12 V battery topped up. Unfortunately, this is not ideally sited, there's shade due to a neighbour's tree, so it rarely produces anything like its maximum output. I also have a small solar panel installed on the top of my velomobile. In the summer this tops up the battery which powers the lights and indicators and provided I don't do too much night time riding but do have the velomobile out in the sun, I don't have to charge the battery. In the winter it does nothing much at all. Nevertheless, there are people who see this small solar panel (approximately 25 x 15 cm - 375 cm^2) and somehow imagine that the energy generated by it propels me rather than my own muscles. It actually doesn't come close. The rated power output is only about 1.5 W. 1.5 W is enough energy to propel me at 0.5 km/h. Note that I have never seen close to the rated output from this solar panel because while it's not in shadow unless I cycle under a tree or it's indoor, the panel is never mounted at the ideal angle to the sun, and of course in the real world I'm often cycling at times of day other than mid-day in summer. Unfortunately, solar power is attractive to people who don't understand these issues at all. I guess it's something about the idea of getting energy from "nothing". Something about a dream of "clean" energy replacing "dirty" energy. One of the most well publicized ridiculous solar ideas of the last few years is the "solar road". This is the idea of making road surfaces out of solar panels. This is a bad idea for very many reasons. Roads are made of relatively cheap and robust materials for a reason: heavy vehicles and weather both take their toll on the surface. On the other hand, solar panels are expensive and rather fragile. It makes no sense at all to run heavy vehicles on top of them. What's more, solar panels need to be completely free of shadow and angled correctly towards the sun to collect maximum light. Neither of these things is possible if the panel is built into a road surface. Because solar panels are expensive, both in terms of cost and embedded energy, they must have a long life-span in order to repay that cost, again both in terms of cost and actually having a positive environmental benefit. A "solar cycle-path" has actually been built here in the Netherlands (I wrote about this before), and it's just as stupid an idea as the solar road. Within a few weeks of being installed it had already failed. This thing will never repay its cost. It will always be a better idea, both cheaper and more effective, to install the same solar cells on buildings with south facing roofs alongside the road. This week I came across two more examples of absurd wishful thinking about the potential of solar power. The first was a bicycle with solar cells in the wheels. The bicycle is claimed to be able to travel at a high speed due to an electric motor powered by the solar cells but the energy input which can be expected from two wheel sized solar panels, which will never be at an ideal angle to the sun and will always be at least partly in shade, can never add up to enough to propel the bicycle. Let's do some numbers: The side area of a bicycle wheel is about 11500 cm^2 (61cm ^2 * PI). We can expect to fit only about 80% of the surface with rectangular panels, leaving about 9400 cm^2. That's about 25 times the area of the panel on my velomobile. If the rated efficiency of those panels is the same as the (quite good) panel fitted to my velomobile then we can expect 25 times the energy production, or about 37 W. That's enough to propel a roadster bicycle at about 11 km/h. However, in reality we won't get anywhere near this figure. That's what we can expect if the wheel is tilted at the correct angle to the sun at mid-day in the middle of summer near the equator. Actually these panels are guaranteed always to be partially in shade, the bicycle won't only be used at mid-day in summer at the equator, and the angle of the panels vs. the sun will never be correct. It's not realistic to expect more than 5 W per wheel. Even that is highly unlikely in my opinion. 10 W in total adds up to a speed of less than 5 km/h. The person pushing this idea has obviously been challenged in the past about the impossibility of what he claims because he's actually claiming to have "shadow optimized solar panels". Of course in the real world no-one makes solar panels for shadow. It's an absurd notion. The energy is in the light. Shadows always contain less energy than well lit areas and even very slight shadowing dramatically drops output. This design is simply yet another piece of nonsense from a 'designer' who will never be able to produce a practical implementation. This is before we even get into the well-known problems of riding disk-wheel bicycles with side-winds, or of wear and tear on the fragile wheel, or what effect a minor crash or merely dropping a bicycle the wheels of which contain fragile solar panels will have on those panels. If it's built then it will come with a mains powered charger and good old "dirty" energy from the grid is where the energy which drives it will really come from. That's especially true for overnight charging, remember, because no-one's solar panels are contributing to the grid at night. The second example of wishful thinking was from someone who appeared to think that cheap Chinese "solar chargers" actually do charge mobile telephones. Again, we can do calculations. The solar panels on these devices often measure no more than 15 cm in length and 5 cm wide. i.e. a fifth of the size of the panel on my velomobile. That means we can expect only 1/5th of the energy production, or around 0.3 W. That, remember, is in ideal conditions. i.e. the solar panel is mounted at the correct angle mid-day in a place near the equator. Don't expect to come close to that figure. It is unlikely that in the real world such a panel ever generates more than 1/10th of this amount for a significant period of time because it won't ever be mounted at the correct angle and will rarely see full mid-day sun at the equator. I'll be absurdly generous and assume that we can get an output which is a third of the specification: This means 0.1 W. Now take a look at real life charging rates for real devices. It takes 10 hours to charge an iPad from an iPhone charger. Why ? Because the iPhone charger supplies "only" 5 W. How long can we expect it to take to charge from our solar charger ? 50 times as long. i.e. 500 hours continuous. Because it works only during relatively bright sunshine, let's be generous and assume 8 hours a day. The charging time would be 62 days. Except that it wouldnt - because actually an iPad discharges its battery in far less than 62 days so this solar charge in reality can't charge the device at all. It's like trying to fill a bath one tea-spoon at a time when the plug has been pulled out. It's emptying faster than it charges. That is why "solar chargers" always also offer the facility to charge them using USB connections. In reality they are always charged from the mains power grid and never from their inbuilt solar panel. Many cheap "solar" products are in fact fake. The first one I found was a "solar powered" calculator which a friend of mine owned in the 1980s. When the battery ran out, it stopped working no matter how long we left it in sunshine. I took it apart and discovered that the "solar cell" was just a piece of coloured plastic. Other people have found similar fake devices and that includes "solar chargers". In reality the energy consumption of mobile phones doesn't even lie in the telephone itself but in the huge consumption of server rooms. This blog is hosted on one of the many servers which belongs to Google - which are surprisingly environmentally destructive. IT already consumes 10% of the electricity generated on the planet. It's already more energy intensive than flying, and this problem is growing. A few hipsters trying to charge their telephones from pointing a small solar panel in the wrong direction while cycling to buy a latte will not avert a global environmental catastrophe. Companies like Google try to claim to be carbon neutral, but they do so by using the slight of hand called "offsetting". This is greenwash. In my opinion, solar power is very valuable indeed. However, as with all things we have to use it within its limitations. Wishful thinking does not influence real life results. For the individual, domestic PV solar power installations are ridiculously good value for money. Probably one of the best investments you can make at the present time. This is because even without a special feed in tariff (the Netherlands doesn't have one) you are in most places effectively "paid" the retail price including taxation for the electricity which you generate and therefore no longer have to buy. For the planet the situation is different. In the daytime we generate more electricity than we use and then at night time we turn on all our lights. I am under no illusions that electricity which we generate in the daytime is used by us at night time. Storage of electricity is on a minute scale world-wide - it's a problem that simply has not been solved, and perhaps there is no good solution (for various reasons there is no reason to believe that batteries will be able to do this). Solar is certainly part of a cleaner future, but at some point we will all have to change our behaviour to use energy when it's available, rather than whenever we want it. The rest of the time we will have to be happy with the 1 kWh per day which our own bodies can produce. Oh, and don't get me started about the people who imagine that mobile phone chargers waste vast amounts of energy. They don't. Anyone who concerns themselves with this particular problem would be better off looking at real energy consumption figures.